This popular and classic Bayliner Pilot House is a great family boat for cruising the coastal waters or inland waterways. Having lived in brackish water for most of her life, she is looking for new owners to up-date, love her and bring it back to its original glory. Fuel efficient Hino (US Marine Power) diesel engines provide a nice cruise while sipping fuel. This three stateroom with two head layout allows for comfortable sleeping for six. A brand new enclosure protects the bridge and the pilot house provides a birds eye view for safe navigation as if your were in the comfort of your own home. This vessel also comes with a tender and outboard which is easily lowered from the davit off the aft bridge. Please bring all offers as owner is anxious to sell. 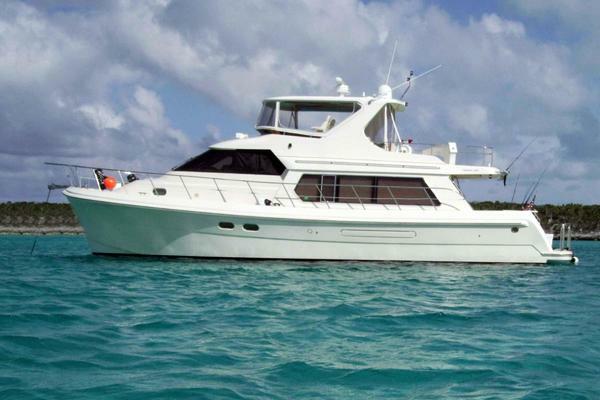 West Florida Yachts would love to guide you through a personal showing of this 45' Bayliner 4550 Pilothouse 1987. This yacht for sale is located in Somers Point, New Jersey and priced at $79,900. For a showing please contact us by filling out the form on this page and we will get back to you shortly! the port and starboard gunwhales. Up three steps from the helm is the flybridge with working helm and aft cockpit where the inflatable tender and davit are stationed.